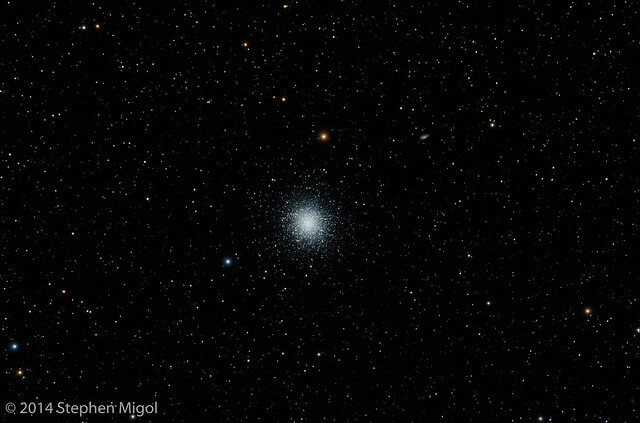 This is a shot of the globular cluster Messier 13, in Hercules. Taken over two nights in the backyard for testing prior to GSSP 2014. Was challenged to fix some problems with camera and mount prior to the star party. The mount part was easy - I re routed some cables so that they didn't snag. The camera part was not easy. During waiting fo rthe skies to clear, I ran the camera to capture a series of dark frames. Unfortunately, during these sequences a piece of flocking paper fell down into the camera body and blocked the movement of the shutter. The shutter electronics a dead and now it will not open. I've had to hot glue the shutter open and now rely on the motion of the mirror plus the electronics of the CCD to time the exposures. Biggest follow up to the shutter issue has been taking flats. Because short duration flats allow over exposure as the mirror flaps up and down, long duration flats are better. I'm now recording flats with a duration of .7 seconds vs 1/60 second. I may consider building a strobe box to further experiment. This image is a sum of 18 exposures at 1200 seconds each at 100 ISO. Processed in PixInsight 1.8 with Crop, DBE, Masked Stretch, Histogram Stretch to reset black point, TGVDenoise, masked curves to boost saturation and reduce muddy sky glow, and unsharp mask on bright stars to tighten. Field of view ..... 2d 3' 16.7" x 1d 21' 29.8"